Well, here we are—finally moved in. Like it very much here, especially the good TV reception. Thanks yours of June 16th. Well here we are - finally moved in. Like it very much here, especially the good TV reception we get here, (all 7 channels), what a relief after the Malibu situation. Was pleased to note your Mother was making good recovery & fortunately no bones broken. Mrs L does'nt care much for Pool swimming - prefers the ocean, the beach is only a couple of blocks from here, so not far to go. Am still taking the Xray treatments (18 to date), the Dr is pleased with the progress, but its still a bit painful & uncomfortable when I eat. Anyway am glad its not serious. They are running the L&H films here again but I do'nt bother to see them as they do'nt start till midnight, the Late late show. I think "Chumps At Oxford" is being shown next Friday night. Think thats about all for now. Mrs L. joins in every good wish to Bob & self & take tare of yourselves. Stan and Ida Laurel moved into the Oceana apartments in 1958. It was his final home. 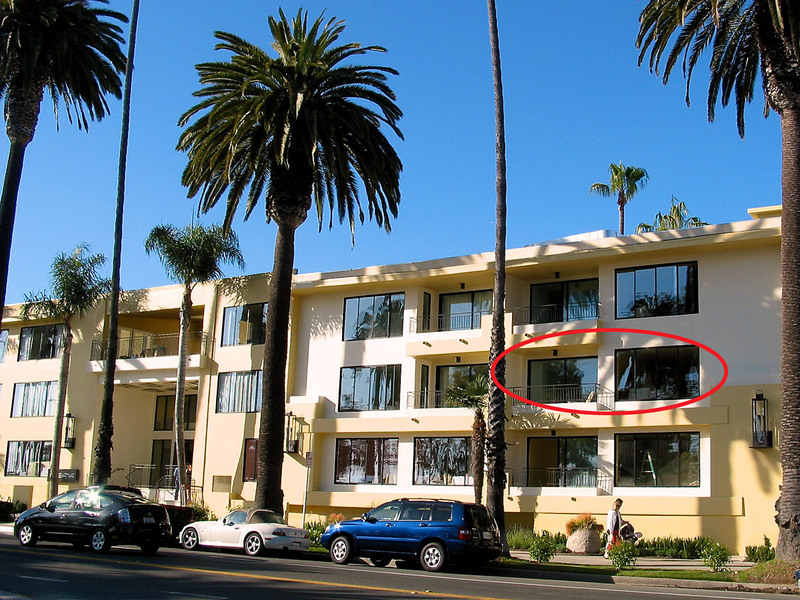 Stan’s apartment (#203—circled) faced Ocean Avenue and boasted a beautiful scenic view of the Pacific. Stan would often step out onto his small balcony and wave to departing guests. Thanks yours of June 28th. Yes, I knew Dante very well, he worked in a film with Mr Hardy & I, called "A Haunting We Will Go" & later appeared in his show (1947) in London England - I guess you knew that he died two or three years ago. I too knew Blackstone very well. You ask me to tell you something about magicians - what did you want to know about them?. No we did'nt wear the same Derby hats in all the pictures, but they were specially made so they could take a lot of abuse in getting wet, stepped on, crushed etc. they were made of a soft FELT material, so they could always be put back in shape. I made my first picture in 1915 & worked alone for several years till I teamed with Mr Hardy in 1927. Think this covers all you wanted to know, so all for now. Bye David - glad you liked the photo I sent you. 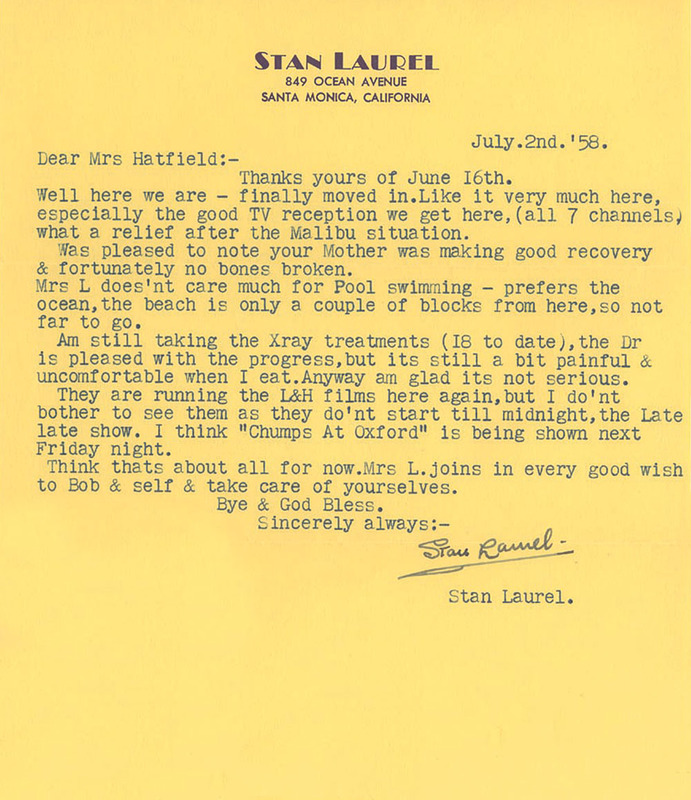 David Meyer, the recipient of this letter from Stan Laurel went on to found Meyerbooks and its imprint David Meyer Magic Books. Sorry delay in acknowledging yours of June.10th. due of course to the moving business from Malibu. Yes Frankie Fouce has grown up, married, & I think [has] four kids. Like his father, he turned out quite a successful business man with projects of his own - how time flies.! Thanks for the Italian boy's address, will send him an 8x10 picture - you should be good for a free spaghetti dinner next time you go there. Note you did'nt start on your trip yet, imagine you are anxious to get that deal straightened out. We like the new place very much - more activity around here so not so lonesome. Am taking a series of X-Ray treatments - had a sore spot inside my lower jaw, caused by irritation of my denture & became infected - had a malignancy test made, but thank goodness no trace of anything. These treatments are to clear it up, the Dr. is pleased with the progress, but its still pretty painful & can't wear my dentures yet - I've sure had my share of sickness these last years. Bye Ernie, take care of yourself. Thanks your letter of June 28th. & post card of the 1st.inst. Pleased to know you recd. the TV guides OK.
Am afraid my writing to your local TV stations would'nt be of any influence in the running of the L&H films - I think it would be a waste of time trying. Regarding your trip down here, it depends on which route you take, you can go direct to Los Angeles, or to Hollywood or right to Santa Monica. If you wish to visit Santa Monica first you take the Coast Highway 101. If you check with the Auto Club they will give you maps & information. My phone number is EXbrook 3-5656. This place is easy to find, as the Avenue faces the Ocean front - three blocks North of Wilshire Blvd. You can't miss it. We also appeared at a Royal Command performance before the King and Queen of England at the London Palladium Theatre in 1947—a thrilling experience. Glad to note you enjoyed your week at the Camp - sounds like you had a lot of fun on 'SKIT NIGHT', I would certainly have liked to have been there & seen the bucket of water routine, it must have been very funny. Yes I am married, & my wife's name is Ida. Mr Hardy & I made several trips Abroad, from 1947.to '54. making personal appearances, we also appeared at a Royal Command performance before the King & Queen of England at the London Palladium Theatre in '47 - a thrilling experience. All for now. Take care of yourself. Thanks yours of June 23rd. Well, we finally got settled in again. It was'nt too had a move, but nevertheless am glad its overwith. Am now taking a series of Xray treatments - I had a sore spot inside my lower jaw, caused, the Dr thinks, by irritation of my denture. I became infected so had a test made to check if malignant - thank goodness there was no trace. Anyway these treatments are supposed to clear it up, have had 20 of them to date & the Dr is very pleased with the result so far, but its still quite painful, & not being able to wear my denture, all I can eat is soft foods. However am glad its not serious & can be cured - it had me worried for about a week, waiting for the test findings - they cut out a piece of the skin to have it examined, sounds awful, but I never felt a bit of pain during the operation or even any after effects, its amazing the advancement made in surgery these days. Note you enjoyed listening to 'Trouping of the Color' on the Queen's Birthday - no never did see it - must be a thrilling sight. Too bad you missed the "Golden Age of Comedy" film, maybe later on it will be shown on TV. Incidently, the TV reception is OK here, can now get all 7 channels - what a relief after Malibu. No, I do'nt think this hotel is connected with any particular chain of hotels, its probably a project of some real estate outfit or Insurance Co. Yes, I knew Harry Lauder very well. When Babe & I played the Empire in Glasgow, Scotland in '47. he came back stage several times to see us. We also spent an afternoon with him at his home in Strathaven, a beautiful place called "Lauder Ha'", during that visit, photos were taken & appeared in "LIFE" magazine. Have heard nothing further on the "L&H Story" - does'nt look too promising to me, but its hard to tell. I hate this long drive just for a 5 minute session, hope it wo'nt be long now before I'm through with it. Mrs. L. Joins in regards & best to you all. Harry Lauder was a Scottish singer and comedian popular English music halls and vaudevillian. His estate at at Strathaven was named Lauder Ha (or Hall), where he died on February 26, 1950 at age 79. Sorry delay in acknowledging your kind letter of June 23rd & also to thank you for the phone call which was certainly a pleasant surprise, so unexpected. I too enjoyed talking to you all, but hope the call was'nt too expensive, as I know on those long distance calls how the time flies & you do'nt realise it when in conversation. Am still taking the Xray treatments (26 to date) I'm sure having a session of it, its still quite painful & I have to take pills several times a day for relief. Anyway, the Dr is very encouraging - says, it wo'nt be long now. We like the new place very much - hope I'll soon be well enough to enjoy it. Again my sincere thanks to you all for your sweet thoughts & expressions, trust someday we shall have the opportunity to meet * I can thank you personally for creating such a wonderful friendship.